winter had taken its toll. The barn door flew open from the strong, chilly breeze And in stumbled Rudolph; he started to sneeze. The light had completely gone out of his nose; He shook and he trembled from his head to his toes. way you can lead Santa's sleigh tonight!" Santa sighed and sobbed, "Dear what will I do: It's Rudolph's big night, but he's got the flu!" answer--Santa, just pray" "Lord, my trustiest reindeer's come down with a cold I can't do it alone, for I'm getting too old!" Then God came to Santa in a brilliant white light Assuring him He would provide for that night. lightning with a big number 3". But suddenly the grandfather clock struck midnight. Santa said, "I give up--there's no time to make the whole flight." Christmas for all girls and boys." But meanwhile at NOAA, the trackers were worried "We haven't spotted Santa; we sure hope he hurries!" Santa, but that's no reindeer!" By 3:45 their journey complete, Santa exclaimed, "I can't believe we've accomplished this feat! and I'm not even aching!" shedding a tear. Saying, "Santa, I see that you need me no more. Well, I'll have to retire;just show me the door." And then by next Christmas, quite a sight you will see, Merry Christmas from Santa, Rudolph, and the Black Number "3"! He calls her name, she still hears him. If I could write the story’s end, I would. To feel your embrace again. In that fleeting moment, he hears her cry. 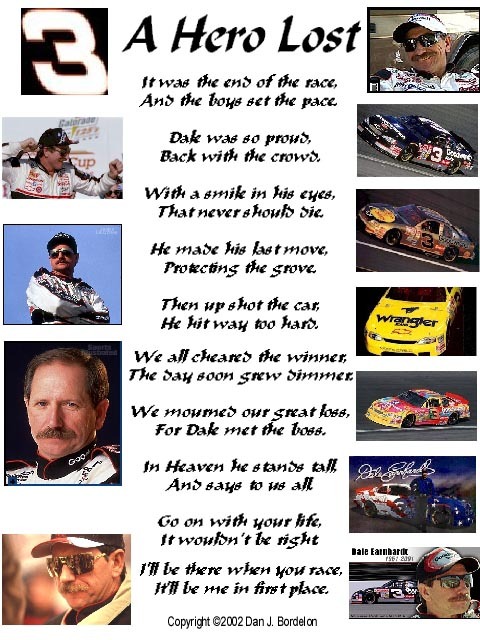 I was beginning to dream of Martinsville's last lap. Looking like Buckshot, heading for a crash. But a pack of magical stockcars closing on me. I knew in a moment it must be the King Petty. "Now, Gordon! Now, Wallace! Now, Kenseth and Newman! 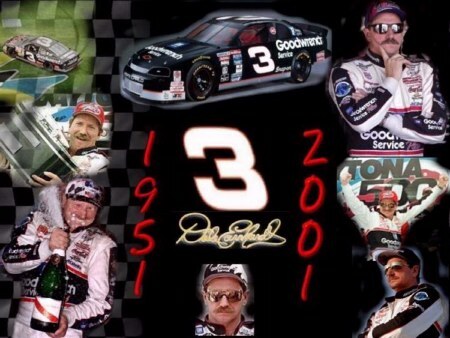 On, Earnhardt! On Schrader! And the rest of his crewmen! Thru the driveway corner! Up close to the wall! Pulling a sleigh full of gifts, and Jolly Mike Helton. The squealing of tires I have grown to love. Down the chimney Mr. Helton came with a bound. And he looked like me after a day at the track. In his hand was a die-cast signed by Dale, Kerry and Kelly. And away they all flew like a nuclear missle. "Merry Christmas to all, and see you in Daytona!"